The giraffe, a mammal native to Africa, is the world's tallest land animal. Giraffes are herbivores who use their long, black, prickly tongues to grasp and remove leaves, flowers and fruits from tall trees and other vegetation. Several ways to identify a male giraffe from a female giraffe exist, besides referencing their reproductive organs. Male giraffes grow up to 19 feet tall from their feet to their horns and weigh up to 4,300 pounds. Female giraffes grow up to 16 feet tall and weigh up to 2,600 pounds, according to the University of Michigan's Animal Diversity Web site. Both male and female giraffes have horns. Females' horns are thinner with dense hair, while males' horns are thicker with hair smoothed from sparring with other males. A male may grow a second pair of horns behind the first pair. Male giraffes are not as social as female giraffes. Males establish dominance among herds by sparring, or clashing their horns and necks against those of other male giraffes. 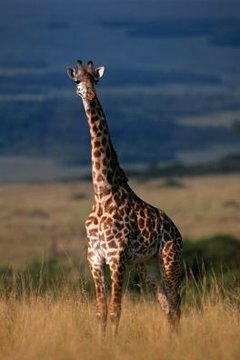 Male giraffes are less selective than female giraffes when foraging for food; they also eat vegetation at higher elevations than females, who prefer to forage for food at or below body height. How Are the Long Necks of Giraffes Adapted to Their Lifestyle? What Are the Special or Interesting Body Parts of Giraffes? What Is the Habitat of a Llama? How Fast Does the Golden Eagle Fly?